That means, of course, that each of those nodes is a point in a 578 dimensional (hyper)space, making it a very strange object indeed, one of Tim Morton’s hyperobjects. The visualization we see in that image is thus a two-dimensional projection of the object, this 19th Century Anglo-American literary Geist. This particular image has been colored according to date, with the oldest in what looks like grey and newest in magenta. Other projections and colorings are possible; and it is obvious that this is an impoverished way to examine the visualization. You want a large monitor with the capacity to interact with the image, to zoom in on specific regions for closer inspection. And you want to be able to click on a node and see what text it represents. There are lots of things you might want to do when you get your hands on this visualization, and others like it. All in due time, I hope. Some might quail at my so matter-of-fact equation between that image and that by now classical term, Geist. I understand. It is not an equation I make lightly. Nor is it one I understand well. I make it because it is a starting point for new investigations. I have no idea how many person-years of work went into that visualization. Not only do we have Jockers’ time over a decade or more, but also that of his many direct collaborators. But we also have, for example, the many volunteers of Project Gutenberg, where Jockers got many of the texts in his corpus. 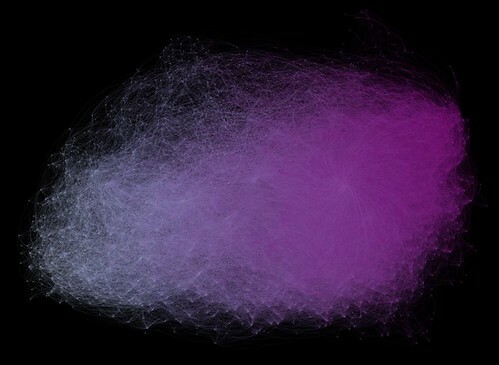 Thus we’ve got a cast of thousands streaming out in social space and historical time from that visualization. What they did is explicit and open to investigation and modification. We can work with it, change it, make it better. We can discover and learn. Dare I say it? We can boldly do where no scholar has gone before. I expect to write three more posts in this series, though that, of course, is subject to change. I should get around to that next week and the week after–other obligations are pressing and I’ve got to go attend to them. One post will conclude my investigation of the “Theme” chapter. I’ll look at what Jockers himself has done with his topic models and link that with what I’ve done in posts 6.1 and 6.2. I’ll then write a concluding post in which I talk about recasting this enterprise in terms of cultural evolution where texts are phenotypic objects, genres are species-like, and words are gene-like; topics then are bundles of gene-like entities that tend to occur together in texts (phenotypic entities). Finally, I’ll tie the whole pile together and write a general introduction.